Coaching your dog to behave well is vital to maintaining a deep and loving connection. Addressing any negative behavior can be a complex process, and you may need to use certain tools to remedy it. Dog training collars are one resource that can guide your dog to better conduct. There are many different kinds of dog training collars available, including e-collars and “shock” collars. But before you or your trainer makes a choice about which collar to use, it is important to know the difference between these two types of dog training collars. Dog collars originated thousands of years ago in ancient Egypt. While collars were originally used to identify ownership, eventually people started using them to control their dogs. Different types of collars were developed for specific purposes, but the names for the different types of collars gradually lost their meanings. Today, people often use the terms “e-collar” and “shock collar” interchangeably. However, they are not the same thing. “Shock” collars originated in the 1960s and were used to train hunting dogs. Those early collars emitted an electric current that shocked the dog when it engaged in an undesirable behavior. 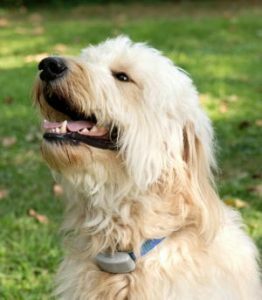 The modern e-collar is not the same as the shock collars used decades ago, and it works differently, which is one reason for the name change. The e-collar of today can be best described as something similar to the tens unit people use for physical therapy. More importantly, e-collar settings are adjustable, with 100 or more levels of stimulation. Just like every responsible dog owner, you love and have empathy for your pet. You certainly don’t want to cause them pain, but you understand the need to curb their aggressiveness, control constant barking, or simply want them to behave better. An e-collar can be a useful training tool in this instance. E-collars use electronic simulation. This means no “shock” is administered to the dog making it a safe method of training. Instead, the e-collar stimulates nerves and sensory receptors via vibration. This stimulation gets the dog’s attention, similar to tapping the dog on the shoulder. Some dogs may need to be stimulated more frequently to get their attention. Keeping your dog’s attention is critical to successful training, and e-collars provide you a means to do this. The stimulation does not cause any long-lasting physical harm to your dog when used correctly, and responsible trainers will reposition the e-collar receiver on a dog to a different position every 3-4 hours. Reputable trainers don’t believe in using an e-collar as a means of punishment because punishment often derails training. The e-collar is simply an effective way to get the dog’s attention so that they stop the unwanted behavior. Once you have used the e-collar properly, and your dog understands commands and shows clear signs of obedience, you’ll not only have a happier pet but you will have the confidence your dog will behave appropriately. If you would like to learn more about dog training collars, give the experts at Come and Train It K9 a call. Our mission is to help create better communication between you and your dog. Contact us today for a free, in-home consultation about what we can do for you and your dog.